This supercharged 1996 Fat Boy has Samson True Dual fishtail straight exhaust pipes, a polished Magnacharger supercharger, a Crane cam, a Mikuni HSR 45 carburetor, large high end reinforced leather saddlebags and a windshield. The motorcycle has new tires and its beautiful Patriot Red paint is in excellent condition. The Harley for sale has a smooth docile 80 cubic inch powerhouse engine with increased horsepower and torque from idle right on up to high range rpm. so come on up to the Black Hills and pick it up in time for the Sturgess Rally. 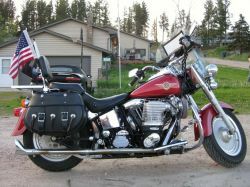 My asking price for the 1996 Harley Davidson Fatboy for sale is a very cheap $10,900.00. The next rally is just around the corner so if your interested please e-mail using the comments form found directly below this classified with your questions or offers. Strike Lightning Used Motorcycles for Sale would like to extend an invitation to anyone who is having problems with their own Iron Horse Chopper to leave their questions with a description the exact problem that you're having and your contact information in the space below and see if somebody who stops by may offer a solution for how to fix your motorcycle and the same goes if you would like voice your opinion by writing a review of Iron Horse choppers. We encourage bikers to submit their opinions and reviews of the 1996 Harley Fatboy for sale, not to put anybody's motorcycle down but to help potential buyers make informed decisions and to benefit the biker community as a whole.